Jonathon gave us a lively talk about the development and changes in paper making through history as well as the home made process we can all try. His talk was made up of photos, taped songs and his own words and then we were all invited to feel (and buy if we liked) sheets of his various types of paper. Paper and textiles have links going back to it's origin. A marvellous day was had by all. Kathy Paton had brought along many pieces of equipment and a huge selection of materials. Together with all the stuff we had brought ourselves we happily made tags of the most lavish kind. We enjoyed the relatively quick creation of small pieces so much that we might do something similar on a practical evening. Many thanks to Kathy for the idea in the first place. To be held in Church of Jesus Christ of Latter Day Saints Skellingthorpe Rd, opposite the petrol station on the Birchwood Avenue junction. Come along and Make gift tags for Christmas/birthdays/other occasions. Using fabric scraps, lutradur, iron on interfacing, stamping and fabric paints, embroidery and bead embellishments. Eight of us met up on Friday evening to sew trees. There was a mix of chatting and comfortable silence. Mary Paulger had spotted this project for us. Stitch a Tree to show support for refugees. This project aims to connect communities and individuals across the UK to show support for displaced people around the world. Participants are invited to stitch a tree which will later be arranged into a large embroidery called Forest by artist Alice Kettle. Forest will be displayed at the Whitworth, Manchester, in September 2018 and in progress at City Space Gallery, Winchester Discovery Centre, from 15th October to 26th November 2017. With canvases stapled to an A5 frame we chose our image, colour and stitches inspired by Mary's lovely piece. By the following Friday meeting two of us had completed a piece and brought it along for the rest of the group to see. You will need a simple design about A5 in size, with at least three distinct areas. Suggestions are a landscape, hot air balloon passing a bridge, small boat on water etc. Stranded cottons - we will be blending 7 or more strands of these to create shading. examples:blues for sky, grey greens for water. Appleton's crewel wool - these can also be blended in the needle. I will have canvas, stapler and a couple of spare frames. Just bring an assortment of what you have and we will share. Anne Woods spoke at our monthly meeting about the designing and making of the Quaker Tapestry (77 panels total) which resides in Friends Meeting House, Kendal, Cumbria. Appleton wool was used for the needlework onto specially woven natural wool cloth (not dyed). Detail of the ship, The Woodhouse, which took the first Quakers to America. The panels tell the story of the Quaker movement and its influence on modern world developments. Only a third of the panels are on display (in Kendal) at any one time. www.quaker-tapestry.co.uk for more information. We all sat together passing along little pieces of coloured paper, following Lyn's clear spoken directions as we folded and tied. There was little chatting as we focused on the work in hand and each of us created four little bright figures, just the right size for a book mark. While we worked we nibbled Japanese snacks and a few of us had brought along Japanese related items to add to the ambience. 40 to 50 sheets of A4 paper ( I use different colours and weights for each page). Decovil Light (I will bring some for sale). 2 hand made or brown paper for cover. A selection of co-ordinating papers (to decorate the outside of your book). Buttons and lace (if desired or anything you wish to add). Threads, thick and thin and buttonhole thread or similar to stitch the pages in. I will bring packs of papers and Decovil for you to buy if you wish. As usual Jaqui was very organised with instruction sheet and pattern together with spare threads and beads. I am always rather awed by goldwork and reel with the names of the materials - gold check purl, gold smooth purl and jap were among the ingredients today. Then I take against the effect of the check purl - too much glistening for me. I realise that I have a long way to go with effective silk shading (and I have admit to being hopeless at reading instructions, but appreciate them particularly after the class). Here is work by Jacqui and some skilled followers. To all Bailgate members - send Kate a photo of your latest work and I will put it on the blog. Or bring it to a meeting for her to photograph. We will be having a Japanese evening on Friday the 30th June. A practical Japanese project will be led by Lyn Rochester – no equipment needed. Please bring as many Japanese things as you can, to give a good atmosphere to the evening and allow us to focus. In Feb 2007 we made Japanese Omyage gift bags. In May 2008 we had fun with Japanese Indigo Shibori over a warm weekend. In April 2012 we had Katie Chaplin for a talk and a workshop and we made Japanese double sided patchwork as well as decorative balls (inserted cloth, Japanese style). 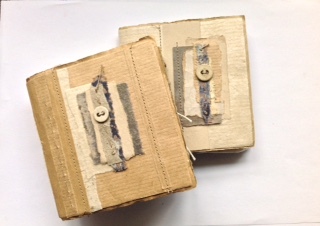 In February 2016 we learned about Japanese book binding from Amy Hewes as a stitch club. You might remember other events and you might have even visited Japan. Bring and share experiences. Emily had brought inks, paint swatch pots and mark makers and gave each of us a brown paper bag with pieces of white fabric, lace, net and lace for colouring. Our water bowls soon coloured as we wet our fabric and made the inks fainter. Many used the emulsion too. We all ended up with wet strips of coloured fabric which dried while we had lunch. After lunch we made a sandwich with bondaweb as the bread and our layered landscape design as the filling. Emily encouraged us to never cut straight as landscapes undulated. She said she put her lightest pieces on top and the darkest on the bottom. Then iron thoroughly both sides. Stitching with loops and fake French knots were her favourite. What a marvellous day and a delightful tutor. Emily uses fabrics and paper; anything that can be used to stitch into. She leaves wire and pins in work. She left work in the rain. The bridal dress feel comes from a favourite aunt who died. Emily used shells, and made shells (mussels) and barnacles. She developed landscape panels which you can see here; Emily handed these round. She frays fabric and cuts into it with a soldering iron. She makes loops and fake French knots with wool or embroidery threads. A Beijing craft magazine portrayed her work and she exports to China. Mary Paulger has been working on the Royal School of Needlework Certificate Course in Durham with Tutor Tracy A Franklin. This piece of canvas work by Mary particularly appealed to me; she has caught so much in one piece – the sense of anticipation waiting by the coast, the wind, the sea and the clouds. She has used a range of canvas stitches to achieve the effect. Here Sheila was inspired by one of Christine Plummer's hanks of various yarns within a colour range. She has worked on the fabric with hand stitch to create an incredible textural effect. Here our chair, Lyn Rochester has hung work that will be displayed behind our sale table. Our branch and the other branches in the county all practised putting up the work which will be a decorative, but not for sale background at the show. Lincolnshire organiser Hilary Farley provided the barn which allowed everyone to see how their work would fit onto the fencing which unites the Embroiderers' Gild branches. There are over 50 cushions made by the Bailgate branch members. They are designed to tuck under the arm to lift it away from any surgery. Our chair Lyn Rochester encouraged us in finishing off our work by having a stitch day in April at her home for all of us.